In short, focus + competition + sharing = higher productivity and less employee turnover. I'm sure we've all been asked to name our worst job. For me, it was washing dishes at John Gardiner's Tennis Ranch. I worked the breakfast shift and clocked in at the absurd hour of 5:00 in the morning. Not only did I have to put up with scalding hot water, an overbearing chef, and harried servers, but it was my job to make gallons of freshly squeezed orange juice. My hands were already cracked and dried from scrubbing countless pots and pans, and the last thing I wanted was to douse them in citric acid. Needless to say, the job was painful -- physically as well as mentally -- and I was never happier than the day I gave notice I was leaving. As I recall, the chef's response was, "Good." Putting bad jobs aside for a moment, over the years, I've spent a lot of time in contact centers. I've worked with IT directors, debugged errant scripts, designed skillsets, and sat with supervisors and agents as they went about their work. From highly functional customer care centers to chew-them-up-and-spit-them-out call center sweat shops, I've pretty much seen it all. In regard to those worst case contact centers, I am sure that I could find quite a few agents who would label that as their worst job ever. Beyond low wages, I expect that most would base their assessment on the dehumanizing aspect of the work. Instead of being treated as important members of a team with a common purpose, they were little more than blips on wallboards that constantly reminded them of how much they weren't accomplishing. Like me and my dirty dishes, piles of unfinished work were always seen as more important than the stacks of spotless china. As a father of three millennials ranging from 26 to nearly 33 years old, I am well aware of how that generation differs from me and baby boomers like me. Most striking is their affinity for teamwork. While trying not to stereotype too much, they seem to like to work in packs and thrive on communication and feedback. It's not that they cannot function on their own, but being a part of something larger is preferred to acting on their own. This is certainly true when it comes to their social lives. They cut their teeth on the likes of Facebook and have immersed themselves in technology that allows them to share what they are doing and where they are doing it in real-time. Whether it's showing off a new pair of shoes or what they had for lunch that day, they proudly live their lives publicly. But how does this behavior carry over to the enterprise, specifically in the contact centers where many millennials begin their careers? Hear more from inContact in this upcoming sponsored webinar, hosted by Enterprise Connect and No Jitter. Join Sheila McGee-Smith, founder of McGee-Smith Analytics, and find out what you need to know before embarking upon your own transformational journey -- and how you can improve performance every step of the way. You'll also hear from Jeff Cordell, CIO and VP of Technology at Language Line Solutions, about how they moved 100% of their business from on-premises Avaya to the cloud, using it as a springboard for groundbreaking technology -- all while cutting costs, growing revenue, and providing exceptional service with 8,000 agents to over 25,000 customers worldwide. Register now, and tune in Wednesday, April 19, at 2:00 p.m. ET. As millennials become the backbone of the customer care workforce, they are met with a system focused on the individual. Rather than being immersed in the nearly constant sharing they are accustomed to, their attention is now solely on the customer he or she is serving at any given point in time. So, while these workers may be part of a team, any sense of teamwork is greatly reduced from what they are used to. The folks at contact center solution provider inContact recognized this disconnect and decided to do something about it. They began with the premise that people work best when they feel respected for who they are and how they are wired to perform. So, beyond simply providing agents with dashboards for real-time and historic data, they added a social component that allows agents to measure effectiveness in the same ways with which they grew up. 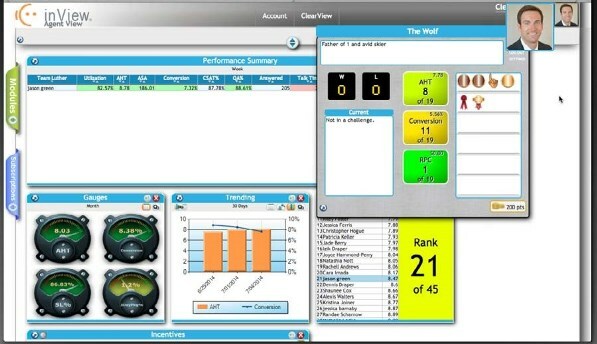 While I wouldn't go so far as to say that inContact has turned its inView reporting solution into the contact center equivalent of Candy Crush, they've added a definite aspect of gamification. Agents can create their own metrics and objectives that can be shared with the rest of their team. These metrics can contain the tried-and-true call center measurements such as hold time and in-queue, but they can also extend to concepts such as deals won, deals lost, and the dollar amount of customer interactions. Thresholds can be set for achievements that allow agents to earn badges, ribbons, and virtual money. To explain, a team can agree upon a set of metrics, create group or individual challenges, and measure the success of all team members in real time. For example, Debbie might bet Claire that she will close more deals in an hour than Claire. Claire can accept the bet, and inView will show their progress throughout the challenge. The winner gets bragging rights, and organizations have the ability attach other forms of rewards for outstanding performance. The results of these competitions goes beyond simple badges. Agents no longer feel isolated from the rest of their team. Even those who aren't participating in a challenge can take pleasure from the horse race. Plus, rather than having to wait for a supervisor's feedback or an end-of-day/end-of-week report, Debbie, Claire, and the rest of the agents get instantaneous updates as to how well they are doing. Let's face it, whether we are acting as individuals or in groups, we all like winning. Better still, we want to know that what we are doing is making a difference. Not only does gamification add a little fun to what might be an otherwise tedious job, it directs agents to concentrate on meaningful metrics. Agents are made aware of what they need to focus on and real-time rewards give them a sense of satisfaction. And back to those millennials, it brings a stronger sense of team to those 20 and 30 somethings. In short, focus + competition + sharing = higher productivity and less agent turnover. While researching this article, I did a little poking around the Internet and found that the folks at inContact aren't the only ones hoping to add gamification to contact centers environments. TouchPoint One offers a product they call Acuity that also strives to strengthen the employee experience and drive business results. Think of Acuity as a score keeper engine for all kinds of metrics and key performance indicators (KPIs). Gamification, which is essentially a specialized metric, is provided by the A-Game component to Acuity. A-Game can be utilized by individuals and teams to motivate and measure performance with a fun collection of challenges and games. Unlike inContact's complete contact center solution, Acuity is an overlay to any vendor's offering. With its collection of dashboards and games, Acuity can work alongside Avaya, Genesys, 8x8, Five9, or any other solution that an enterprise might deploy. Another thing that makes Acuity unique is that it doesn't require a contact center in order to motivate and/or intensify an individual or team. A-Game's challenges can be utilized by any worker regardless of his or her job description. This means that gamification can be added to both the folks working on the loading dock and the gray-suits in the legal department. In fact, I don't see any reason why a company couldn't have a C-Suite challenge to pit executive against executive. I would pay to watch that. As I have made perfectly clear over my hundreds of articles for No Jitter, I am no spring chicken. However, I am not a grumpy old hermit who wants to sit behind a computer screen all day long without communicating with my coworkers. I like atta-boys as much as the next SIP geek. I like being recognized for meeting goals and accomplishing difficult tasks. Adding gamification to my job might lead to higher employee satisfaction ... and when Andrew is happy, everybody is happy. Now, let's pretend that I am 27 again (don't I wish), and my entire life has been centered on group projects, regular feedback, social media, and the technology that connects them all together. Would I want to be thrust into a job that isolates me from my coworkers and the world in which I grew up? Absolutely not. That's where techniques such as gamification can turn anyone into a happy, aggressive (in a good way), productive, focused, long-term employee.